Around 100 Miracle Makers and their guests attended the 7th Annual Miracle Maker Leadership Council Funding Awards Celebration on April 26, 2018 at the offices of Eaton Vance Management and NextShares Solutions LLC, who have generously hosted this reception for our major donors in each of the last four years. We are thankful for Eaton Vance Management and NextShares Solutions LLC’s support and leadership. Heavey congratulated the Miracle Makers for leading by example by taking action and showing courage. “A year ago,” Heavey explained, “there were 114 Miracle Makers. Today there are 145.” Because of the support of the Miracle Makers and our sponsors, in 2017 Expect Miracles Foundation awarded over $1 million to cancer research and patient care programs for the first time in its history, which included a record $825,000 to Dana-Farber’s Belfer Center for Applied Cancer Science. Dr. Paul Kirschmeier, head of Cancer Therapeutics at the Belfer Center, thanked the Miracle Makers for their support, leadership and trust. He explained that with the support of Expect Miracles Foundation, the Belfer Center has taken the liquid biopsy technology it developed for lung cancer and begun work testing the technology with breast, colon, head and neck, prostate, skin and pancreatic cancers, with the ultimate goal of early detection diagnostic tests. Next, the 2018 MMLC Funding Awards were announced totaling $61,500. Jim Keenan from Citi proudly presented the first MMLC funding award - a $4,000 award to From Maddi’s Closet. Keenan accepted on behalf of the California-based organization. The grant will support patients at Children’s Hospital Los Angeles and Children’s Hospital Orange County, ranging from providing pediatric wheelchairs, 4-wheeled walkers, therapy tricycles, helmets, bed lifts and canes, to providing assistance with prescription co-payments, holiday toy drives, and teen events at the hospitals. Frank Heavey presented a $6,000 check to Brianne Carter, Co-Director of Integrative Care at The Virginia Thurston Healing Garden Cancer Support Center to support the newly established “Expect Miracles Referral Program.” The Expect Miracles Referral Program will be a formal, strategic referral program in the major Boston, MA area hospitals and cancer centers, offering patients 2 free integrative therapy sessions at the Healing Garden in order to incentivize the underserved population to explore additional adjunct care. Heavey also presented the next grant of $7,500 to Toots Fore Tufts. Named in memory of Marc “Toots” Jackson, Toots Fore Tufts’ mission is to help remove financial obstacles for those who are already fighting for their lives. Brian MacPhee, who is the Vice President and a Founding Board Member of Toots Fore Tufts, and an MMLC Member, accepted this grant. The grant will provide complimentary Reiki to those diagnosed with brain and spinal cord cancer at Tufts Medical Center in Boston, MA. Reiki is a Japanese healing method/art used in hospitals and healthcare settings to promote relaxation. Mark O’Brien, from Best Credit Data, presented a $10,000 award to Bubba Strong Charitable Fund, Inc. whose mission is to help local families impacted by life threatening diseases, similar to the family of Greg “Bubba” Jacobson who was diagnosed with a rare form of Sarcoma in March 2015. Greg “Bubba” Jacobson accepted the check on behalf of the organization, along with George McLoughlin, Treasurer of Bubba Strong Charitable Fund. 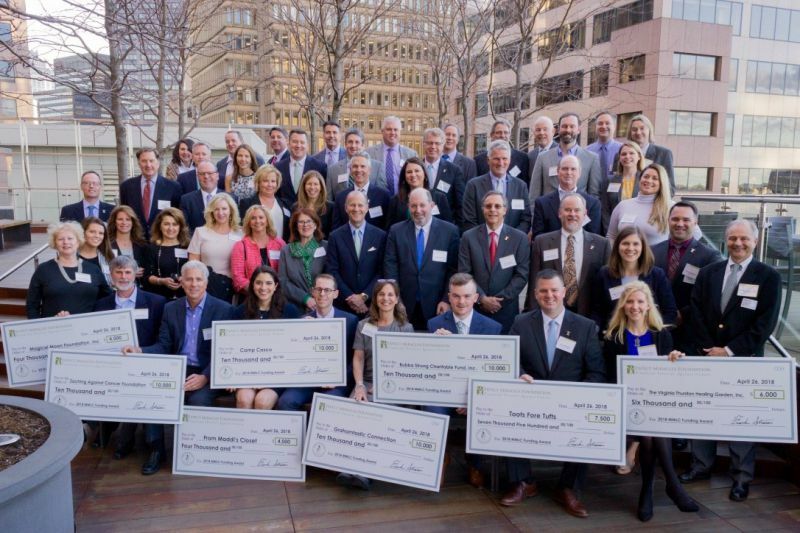 Brian Rudenaurer, from State Street, a young professional Miracle Maker, presented a $10,000 grant to Camp Casco in Massachusetts to cover the entire cost of day camp this summer for 12 children from New England who have or have had cancer. Funding will cover the campsite, medical shed costs, meals, snacks, and medical and programming supplies to keep the campers safe and entertained throughout the week. Whitney Silkworth and Nathan Schauer graciously thanked Expect Miracles Foundation and the Miracle Makers for their continued generosity and support. Maggie Dombroski, Assistant Director of Expect Miracles Foundation and a Miracle Maker herself, presented Grahamtastic Connections with a check for $10,000. Gramtastic Connection’s mission is to provide free technology to children with cancer and other serious illnesses for educational purposes so that children undergoing long-term treatment can stay connected with their classmates through robotics. Leslie Morissette, Founder & Executive Director, thanked the MMLC and shared how her charity was started in honor of her son who had passed away from cancer. Board of Director of Expect Miracles Foundation and MMLC member Irene Speridakos from BNY Mellon, presented the final funding award of $10,000 to Zaching Against Cancer Foundation, from Baltimore, MD, to provide funding to their two newest partner hospitals in its Direct Patient Outreach Program. John, Christine and Julia Lederer all accepted the award and John thanked the Miracle Makers for the award and explained that before his son Zach passed away from brain cancer, Zach started the charity to provide integrative therapy to patients because Zach wanted others to feel strength, determination and hope. Heavey closed the reception by thanking the Miracle Makers for their courage to face hurt, their teamwork in getting others involved, and their lasting impact on the lives of cancer patients and their families.